In most white-collar workplaces, an annoying boss or irksome co-worker is referred to as a “pain in the neck.” But for forklift drivers, another type of pain is all too real. 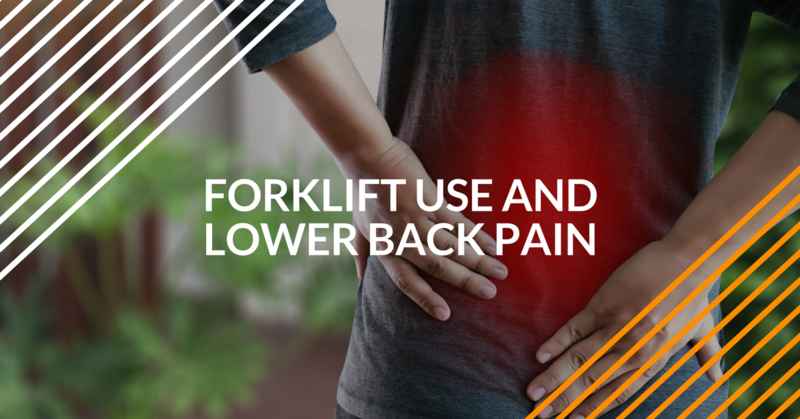 As far back as 1987, when the first widespread study about lower back pain and forklift operation was conducted, research confirmed what many forklift drivers already knew: the profession had more than its share of flare-ups, inflammation, and soreness in the lower back area. But what exactly is the source of forklift back pain? And, if you’re a forklift driver and suffer from frequent on-the-job lower back problems, what can you do to alleviate the pain? Proper forklift operation is a great start – and ForkliftCertification.com, the leader in online OSHA-compliant forklift training, has a great assortment of training programs that show the correct way to operate pallet jacks, stand-behind lifts, and regular forklifts. But more on that later – let’s look at what causes lower back pain when driving a forklift. Lower Back Pain & Forklift Driving: What’s the Link? So what exactly is causing this mini health epidemic that impacts many forklift drivers? According to a widely discussed 2005 study, forklift back pain among forklift operators might be a symptom of overall back and neck issues; neck pain was a common complaint with most of the workers interviewed. And the same study provided a rather shocking figure about the number of forklift drivers affected by lower back pain: up to 95% of drivers studied complained about some sort of lower back pain. Poor posture: Forklift operators are usually involved in some sort of twisting, bending, or leaning over, especially when they’re not in the driver’s seat. From trying to see around a warehouse corner to helping a co-worker with a shifting load, there are plenty of opportunities to stress the spine. Plus, forklift operator posture while driving was found to be not optimal for spine compression. Exposure to vibration: Forklifts – especially older models – are prone to significant vibration, which adversely impacts driver posture and spine positioning. After so many hours operating a forklift, this vibration takes a toll, particularly on the lower back region. Given these two factors, what can you do to lessen (or altogether avoid) lower back pain? Since poor posture and excessive vibration were found to be the two most common reasons that cause forklift back pain, it obviously makes sense to do everything possible to correct these habits and working environment conditions. On the posture front, see if a lower back support belt helps. If you’re prone to “slouching” when sitting, see if your supervisor will let you use a standing forklift. And vice versa; if your lower back aches during prolonged standing, try a forklift with a comfortable, ergonomic seat. The vibration issue is more difficult to address, simply because all forklifts have some sort of vibration. One way to limit the impact of forklift vibration is to ensure you’re taking the recommended breaks from work. For example, if you spend twelve straight hours behind the wheel with no breaks, the vibration will make your lower back pain even worse. One solution might be a cushioned seat; this can help lessen the vibration on your lower spine. Experiment with some different ways to address lower back pain with your supervisor. But the first step is communication – just let your boss know your issues. Two people working together to solve the problem is better than one! Thanks for reading our blog! If you’re interested in signing up for our Training Kit, Train a Trainer, or Bundle Package programs, it’s easy to sign up. For more information about our OSHA training, please call our office directly at (888) 278-8896.